Stone walls are strong and attractive, but they are also expensive and require considerable building skill to construct. Increasing the height of a stone wall, by adding more stone, incurs the same sort of high costs as creating a new wall from scratch. It may be so costly that the project ceases to be practical. 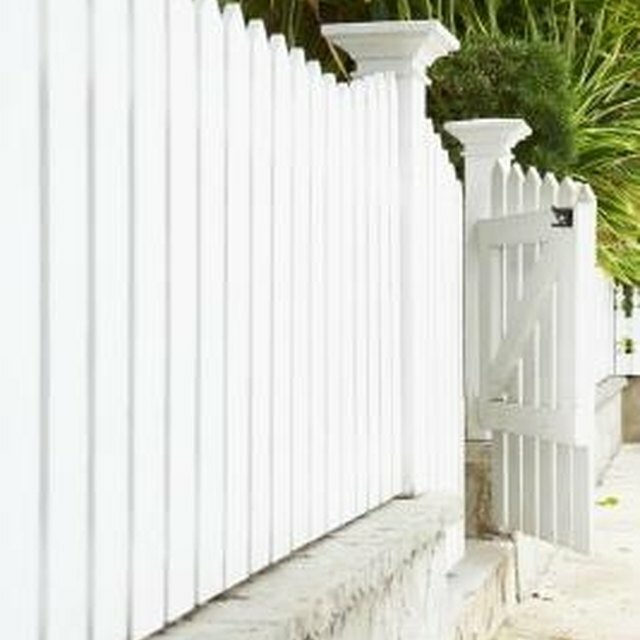 A far more economical solution is to add a wooden fence along the top of the wall, thus increasing the height while keeping the expense as low as possible. Constructing stone walls is far more expensive than building wooden fences. Position a post socket on the top of the wall where the first fence post will be. If the fence will be aligned with one edge of the wall, align the edge of the post socket base plate with the edge of the wall. If the post is in any other position, use a tape measure and a builder's square to locate the post and align it precisely. Mark the center of each of the base-plate anchoring holes on the stone wall. Use a pencil to trace around the holes, or carefully mark the center point of each one. When finished, the positions of all the anchor points on the base plate should be clearly marked on the top of the wall. Remove the base plate and put it to one side. Fit a masonry bit into the chuck of a hammer drill, then tighten it with the chuck key. Make sure that the bit is centered and tightly clamped. Remove the chuck key, then test the drill by gently squeezing the trigger. Make sure that the bit spins in the correct direction, without wobbling. Drill into the top of the wall to the depth recommended by the base-plate manufacturer, or to the depth required to accommodate the screws you intend to use. Make sure that you drill vertically and exactly on the marks made in Step 2. Push screw anchors into the holes and tap them into place if necessary. Reposition the base plate over the holes and attach it to the wall using appropriate screws. Don heavy work gloves. Insert a pre-slotted fence post into the socket on the base plate and secure it. Methods for securing posts vary, but they include tightening clamps, simply hammering the post into the socket until it fits, and securing it with screws or carriage bolts. Consult the manufacturer's instructions if the method is not obvious. Fit a second post into another post holder and rest it on the wall roughly the length of one fence panel further along the wall. Fit a fence panel into the slot on the first, attached post. Adjust the position of the second, unattached post until it can support the free end of the fence panel. Align the post-holder base with the first post holder and mark the positions of the anchor holes on the stone wall. Remove the fence panel and the post holder and place them to one side. Drill holes, insert screw anchors and fit the post holder, as described in Steps 4 through 6. Fit the fence panel by dropping it from above into the retaining slots between the two posts. Add additional posts and panels along the length of the wall until the fence is complete.